Kitty Mason, The Edinburgh Lace Course Director, was made an MBE in the New Year’s Honours List. She received the MBE for her services to lace-making. Kitty has been making lace for 40 years and since 1978 has been teaching it too. She has taught hundreds of people over the years and enthused them with her love of the craft. 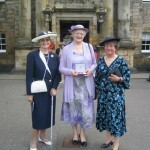 On the 5th July Kitty was invited to Holyrood Palace to receive her award from the Queen. She is seen here proudly displaying her medal to Mary Lawrie and Sue Clark, two her oldest lace making friends. Kitty’s 3rd guest, her sister, was behind the camera.